Target 1 face-up monster your opponent controls; the ATK of all other monsters currently on the field become equal to that monster’s ATK, until the end of this turn. Universal Adapter is a nifty end-around to lowering an opponent’s ATK and can potentially be your saving grace. Trap, so slower, but chainable in the Damage Step. You need at least two monsters on your opponents field for this to have any effect, that’s attainable, but you’d like them to have no monsters if possible at all times. Select a lower ATK monster your opponent controls and all other monsters become that monster’s ATK. This can stall your opponents moves for the turn, but you need to play it at the right time. If they attack, you can lower the higher monsters ATK, and maybe defeat that one monster in battle, giving you a 1-for-1 off this. If you can attack each monster, you can wipe their board if you lower the other monsters ATK enough. The best application of this would be if your opponent had a Scapegoat token on the field and while doing their Link Summon plays, you activated this when they had a goat, but were all but done with their Link Summoning. This would force them to wait out until next turn. Likely though, you won’t be getting something like that. You’ll likely have a 500-1000ATK drop at most depending on the deck you play against. Universal Adapter is cleverly named but not particularly special. It’s a free Normal Trap that targets an opponent’s monster and makes all monsters on the field equal to that ATK value until the end of the turn. Since it’s not a spell, you would have to wait to use it offensively. Defensively, you might lower some boss monster’s ATK. That being said, just use Waboku. There will hardly be a need for this ever. Universal Adapter is probably going to be universally underused. We go from an outstanding card yesterday to a niche card today, Universal Adapter. 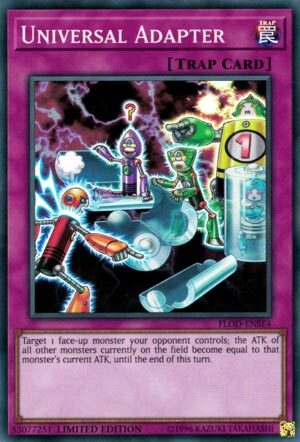 Universal Adapter is a Normal Trap that when activated, you target a face-up monster your opponent controls and the ATK of every monster currently on the field becomes the ATK of that monster. I guess this can be useful to crash into something your opponent has that is bigger than anything you control, then attack with the rest of your monsters. It can also make your opponent question if they want to attack as the battle will kill both monsters 95% of the time after this is used. Universal Adapter is an interesting card, though pretty niche. Honestly, I’ve seen far worse niche cards in the past, I say have fun with this card! Art: 4/5 I’d love some more actual Batteryman support, please. Though I guess the new Thunder Dragon fusion will be cool for that. This card just screams Tech to me, and also, like yesterday, seems to be one you could use offensively or defensively. To use it both ways, you could use it in a pinch to summon something weak (say 1000 or less attack) and make all your opponent’s Monsters (ideally who are rather strong, say 2000 or more) match that, then Special Summon, ideally in a swarm, and you could kamikaze into them all. Realistically, sadly, I just don’t see a great use for this. Everything being equal, you’re going to just destroy your Monsters, as well as theirs. Which leaves you at a -1, because you still played this card to start. I mean, you could get lucky and have three Kaiser Gliders on the field or something right? Then you’d finish +2, at least in that position. Seriously, I do like this card, I’m just finding a really hard time finding a way to get much out of this that justifies to play it.